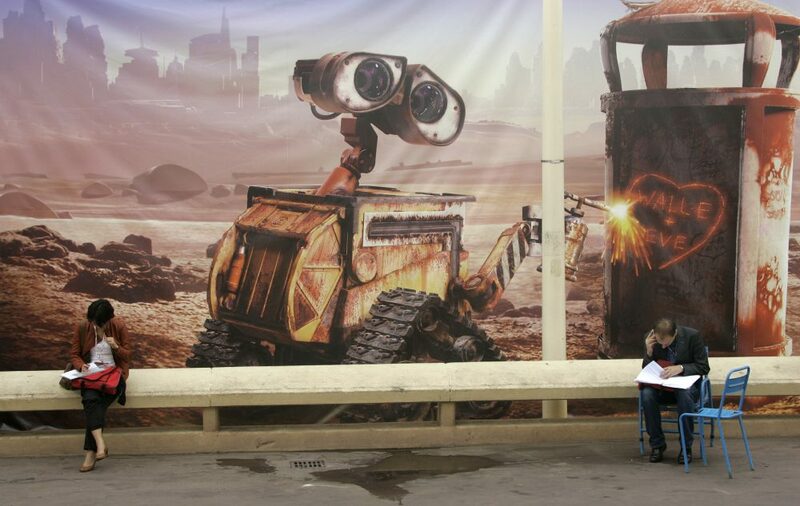 Visitors sit in front of a WALL-E poster at the 24th MIPCOM (International Film and Programme Market for TV, Video, Cable and Satellite) in Cannes, France, Oct. 2008. Photo by Lionel Cironneau/Associated Press. Can we have all the adults in the room stand up and chant in unison: “Who’s Afraid of Global Trade? Who’s Afraid of Global Trade?” That should calm us down. It worked for the three little pigs. I understand that when things are going badly it is our human instinct to find the culprit among the “others,” which often means foreigners (excluding the countries from which our personal ancestors immigrated). Per President Trump, the Chinese and Mexicans are the wolves currently devouring our jobs. Let’s breathe deeply and think hard about this issue. I think we have a good reason to be afraid. There really are aliens taking our jobs. These aliens carry out their assigned tasks with alarming accuracy, they work long hours without complaint for very low wages, they don’t join unions, and they don’t fall in love, which can be very disruptive at the workplace. You know who might soon take your job, don’t you? It’s the robots. It’s the microprocessors. It’s WALL-E and R2-D2. That’s something to worry about. If your children and grandchildren can only carry out mundane repetitive tasks, they will be in a world of hurt, since they will be in direct competition for jobs with those efficient, reliable robots. Those robots will do not just the physical tasks but also the intellectual tasks that require only artificial intelligence. Traditional lecture-and-exam-style education creates artificial intelligence; simply put, it merely programs the students to respond the way their instructors think is wise. With the surge of computerized artificial intelligence all around us, we are making traditional education obsolete. Be afraid, university lecturers. Yes, trade is a factor in jobs evaporating—especially the surge in imports from China—but more as symptom than disease. It’s not barriers to our exports to China that are the problem. It’s our failing educational system—which is not producing enough people ready for a world economy ever more reliant on artificial intelligence—and our pathetically low national savings rate, which requires us to rely on the savings of countries with high savings rates, like China. These problems of education and savings are homegrown, and can’t be blamed on the Chinese and the Mexicans. Before we scapegoat anyone or get scared about trade, we need to understand it. So let’s start by contrasting balanced trade, with imports and exports equal, and then unbalanced trade, with imports well in excess of exports (as is currently the case in the United States). If the U.S. had balanced trade, the right question would be, “Are China and Mexico partners of the U.S. or competitors?” Competitors produce the same goods, but partners specialize and do not produce the same products. If we were partners, China would produce the T-shirts and jeans and consumer electronics, while we would produce Boeing aircraft but no T-shirts or jeans or consumer electronics. If we were partners, China would stock the shelves at Walmart with low priced goods, while we would produce none of the same goods in the U.S. That kind of partnership is a win for all Americans who would get to buy Chinese goods at low prices without any downward pressure on wages from Chinese competition. If we were partners, the U.S. should work to maintain that partnership by increasing its economic distinctiveness by elevating the educational attainment of our workforce. Think of it as a global educational race with the leaders enjoying a partnership relationship with the followers, but with the great mass of runners behind competing fiercely against each other. Look behind us. Can you see them all catching up? On the other hand, if we were to find ourselves back in the pack, and Chinese products were still produced in the U.S., then China and the U.S. would be competitors, and wages of U.S. low-skilled workers would be set in Beijing, not Los Angeles. If we were competitors, not partners, we could put up barriers to imports which would reduce the competitive pressure on wages of our low-skilled manufacturing workers. Of course, that would shrink both imports and exports, thus forgoing some of the benefits of specialization according to comparative advantage. That might be wise public policy if the benefits to our middle class exceed the lost gains-from-trade. But we should insist on some evidence for that view, especially given the ongoing force of automation on our middle class. And even then, barriers to imports from China and Mexico would be treating the symptom, not the real cause of lower wages—our failing educational system. Of course, the Trump administration is not thinking about that education system, or about balanced trade. It is obsessed with our trade deficit, and using it to fuel an anti-trade backlash. But Trump doesn’t understand where that deficit comes from. The trade deficit is a consequence of our low savings rate, not impediments to our exports. When the investment opportunities in the United States exceed the flow of U.S. savings, we are forced to borrow from foreigners to fund some of our investments. That borrowing creates a demand for U.S. dollars, an elevated value of the dollar, suppressed exports, and increased imports. The right public policy to reduce our external imbalance is to encourage savings, for example through a matching by Uncle Sam of your contributions to your retirement accounts, or by getting the federal deficit under control. It isn’t good policy to go to our Chinese lenders and insist on higher interest rates! Workforce development and greater national savings—that’s what we need. With those problems solved, there is no reason to worry about wolves devouring our jobs. Edward E. Leamer is a professor of economics and statistics at UCLA and director of the UCLA Anderson Forecast.